Jonathan Watts details how China is pushing ahead with emissions trading schemes and other green economy initiatives, while the United States remains stuck in Congressional quicksand. It has been clear for some time that the Asian powerhouse is moving more rapidly on renewable technologies. A recent report by Pew Charitable Trusts shows China led the world last year with a .4bn investment in clean technology, about 40% higher than third-placed America. On Monday, a senior Chinese official said mandatory emissions trading systems will be rolled out in six of the country’s most advanced regions by 2013. After the pilot schemes in Guangdong, Hubei, Beijing, Shanghai, Tianjin and Chongqing, the government has promised to ramp up the use of carbon-based financial instruments to a nationwide level by 2015. It is a sign that China is both desperate and ambitious enough to try almost anything. The widely trailed move towards a cap-and-trade system will provide an extra tool for China to achieve its Copenhagen commitment to reduce carbon emissions relative to economic growth by 40-45% below 2005 levels by 2020. Cap-and-trade initiatives in Washington started much earlier, but have sunk in Congressional quicksand. The first US experiment in emissions trading came to an end four months ago with the closure of the Chicago Climate Exchange, though California’s scheme (the world’s second largest) is reportedly in talks to expand by joining with Europe’s. Critics of emissions trading will undoubtedly say the US is better off without it. Europe currently has the world’s biggest carbon market, which has channelled billions of dollars towards projects in developing nations that are designed to reduce emissions. China has been a major beneficiary, accounting for about 60% of the world’s carbon credits. But the United Nations mechanism for evaluating credits has been plagued by allegations of fraud and misallocation of resources. In the latest scandal, Chinese officials denied this week that the country’s factories were manipulating production of hydrofluorocarbon-23 – a powerful greenhouse gas – to qualify for huge quantities of carbon credits. The European Union is unimpressed and will ban such credits when its new emissions trading system starts in 2013. Existing schemes are clearly flawed. But by opting out, the US is losing its ability to influence reform, just as China begins to establish what could become a rival trading system. Beijing has positioned itself cleverly. In the years ahead, its influence will grow in both renewable technology and climate finance. 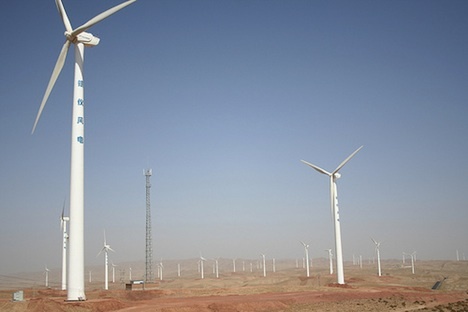 This has prompted the analyst Søren Lütken to talk of an emerging Grand Chinese Climate Scheme. It is far from certain that this will be successful. Corruption, imprecision and inexperience are major hurdles that China has yet to overcome in establishing a cap-and-trade scheme. Lobby groups could water down plans that will cost industry money. As in the US, the economy will remain dependent on fossil fuels for many decades. Yet compared to the US, China seems to have a clearer sense of direction, greater flexibility and a willingness to move. Expect more of the same in the coming years. The world’s red and green lights are not where they used to be.